First, enjoy this picture of the iPhone. I like the shuffle version myself. I don't know if there is anything to the Nano or Shuffle but it's a cool picture I found. 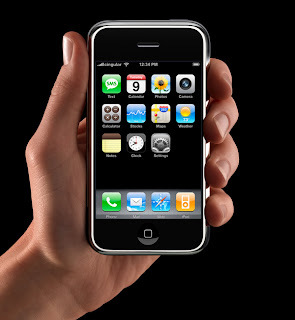 The iPhone, like Steve Jobs has advertised, is revolutionary. I could easily come up with my top 10 reasons for buying it. And, as Dan Ray has done, I could easily come up with my top 10 reasons for not buying it. THEN THERE IS REALITY. On June 29th there are going to be millions of people who drive to the AT&T or Apple, Inc. corporately owned store nearest to them and pick up their first iPhone. Me, well, I’ll be working. When I do finally get off work, it will be too late to make it to the nearest location selling the iPhone. The next day, I’ll get up and go to work; again, before anyone selling the iPhone even thinks about getting out of bed. And again, I’ll get off work after all those sellers close their doors and go home. This will go on for 4 days. On the 5th day, all the stores will be out of stock. Another point I agree with Dan on is the fact that Google Maps will be on the phone but GPS won’t. The missed the opportunity to link a navigation system to the greatest maps program around. Bonus reason: Apple, Inc. and Steve Jobs really do a great job with their products. Lately, I’ve learned so much about Apple’s ability to get rid of a lot of the problems that Windows driven PCs have. Errors, incompatibility problems, crashing, ease of use, syncability, etc. are all things that Apple has done a great job of limiting. I think that Bill Gates and Steve Jobs both are missing the mark on where computers should go in the future. They were both unable to adequately answer the questions of where they saw computers in 5 years, at the D5 conference. The iPhone is a step in the right direction, but it’s just a fancy phone. The next revolutionary product should be the personal computer you take everywhere. It should be the size of the iPhone, have memory in the terabytes range, have the ability to sync with anything (monitors, keyboards, mouse, TV, networks, Bluetooth, Wi-Fi, cellular, satellite, etc. ), and simply be your only computer. The iPhone is going to be great. I will enjoy checking out Ted’s. I won’t be buying one myself unless I win the lottery, sell my house, make more money, or the next gen iPhone comes out with everything I mentioned above. Check out Dan’s original post here. Check out Ted’s rebuttal here. Nice, I think the iPhone could be better, but if they made it the way we wanted it to be it would cost a lot more, well more than you can imagine. I surely hope that it is everything that I imagined and I know that they will update it in 6 months to a year, but what am I going to do. Wait for infinity for a new phone when I needed one 6 months ago. I don't have any problems with a 2 year contract. Verizon made me sign 1 for a crappy phone that I have replaced 4 times already. June 29 can't come any sooner for this camper. 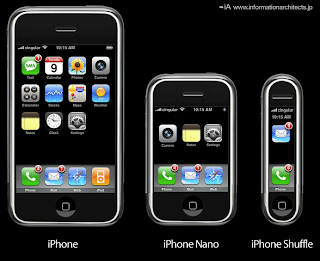 The iPhone Nano and Shuffle don't exist. I have never seen those pictures. Funny. Now THAT'S what i'm talkin' about. You win, i'll put the link up now. The iphone shuffle has only one button and will randomly call a person in your address book each time you press it. Nice on the 3G I didn't mention that because, who would understand it?